Image: Sean Scott/Getty Images. Design: Ashley Britton/SheKnows. Now that summer weather has rolled in, whether your plans include jet-setting to Ibiza, hanging at the local YMCA or just a blowup kiddie pool in your backyard, there will likely be bathing suits involved. In fact, we're pretty sure that during the summer months, swimsuits count as clothing. And what better opportunity than beachside (or poolside or in the backyard) to do some twinning with your mini? But seeing double doesn’t have to mean losing your personal style — or leaving your kids out of said (super-chic) style. 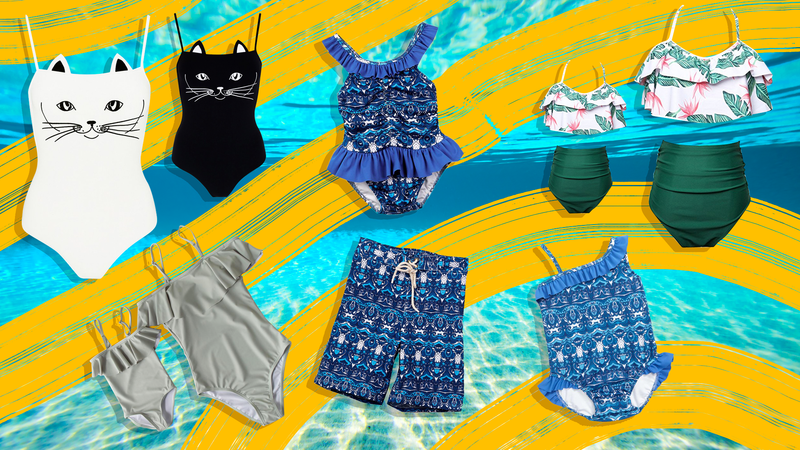 With that in mind, we’ve gathered the best mommy-and-me swimsuits for you and your littles. The 15 suits ahead are bound to please those of you with a swimwear addiction — or who just like dressing your kids alike. (Anyone else’s parents dress them in matching outfits when they went out so as not to misplace a child? No? Just me then.) 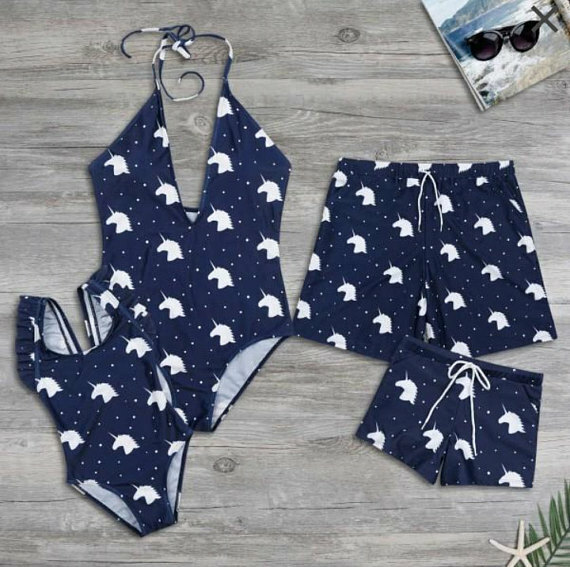 And hey, you and your newly matching swim kiddo are just in time for the Fourth of July yard party of your summer daydreams. Nothing says chic like neutrals and a cutout style. This striped suit comes in an itsy-bitsy, teeny-weeny bikini for your tot — and a beautiful one-piece for mom. Who doesn't love a good cat print? This one-piece for both of you screams double trouble with a sly cat face (complete with adorable ears). This bikini's high waist and stripes are old-school cool, while the bow detail on the top is sweetly charming. Stunning watercolor florals decorate this one-piece, which is fade-resistant, chlorine-resistant and UPF rated for 50-plus. Two words: squad goals. This amazing one-piece is all you need to let the other kids at the pool know who's your No. 1. 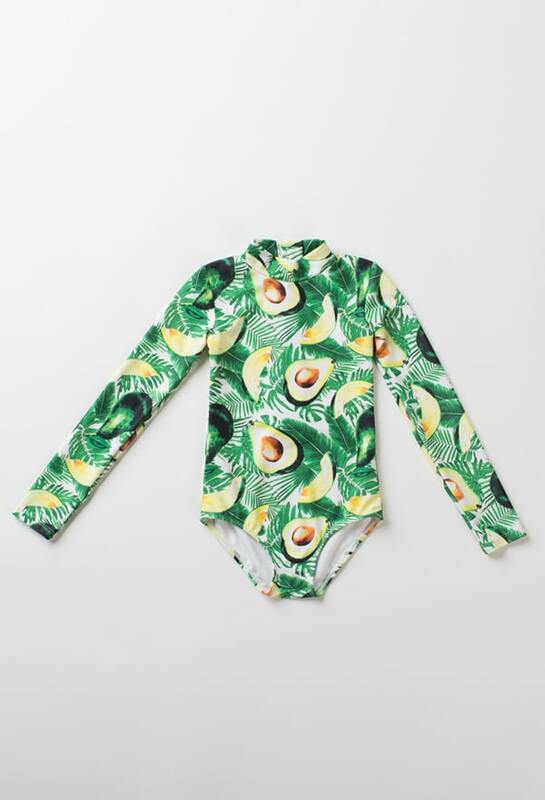 This comfortable cactus swimsuit is both on trend and adorable for you and your prickly little one. Looking for something a little more subdued? This suit's lack of bright patterns and bold colors doesn't dampen it's amazing fit and feel. A perfect example of less is more. Who said you can't twin with your little man? This gorgeous halter for mom is perfect for dancing in the waves, and the swim trunks are the perfect length to avoid the dreaded swim trunk wedgie. The struggle is real. 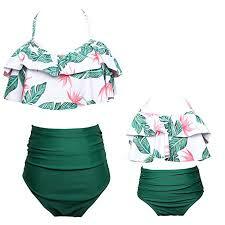 Palm leaves adorn this cute suit, and the adjustable straps and high-waisted bottoms make this purchase a no-brainer. Few things are sweeter, more tropical or reminiscent of summer than pineapples, so this flouncy bikini and swim trunk pair is a match made in swimsuit heaven. For those of you who need a little more coverage, these rash guards come in a variety of patterns and offer UPF 50-plus for the ultimate sun protection. Get you and your little one a picture-perfect pair of swimsuits with these — a striped-and-floral bikini for Mom and a one-piece for baby. This darling mommy-daughter pair has been worn by Chrissy Teigen and her daughter Luna, and, quite frankly, is the coolest rash guard we've ever seen.